Vermont. It really is as beautiful and green as you imagine it to be. On this goal-oriented, summer bike trip you’ll pedal through Vermont’s deep green valleys, famous for covered bridges, cool streams, cow-dotted pastures, and charming small towns. Along the way you’ll kayak Lake Champlain and volunteer on a local community service project. Together as a team you’ll make your way north, cross the Canadian border, and reach your final destination, Montréal. A fun contrast to rural Vermont, this lively, cosmopolitan city offers the perfect international setting to celebrate your many amazing accomplishments. We’ll start our ride in the charming village of Poultney, where we’ll get to know each other and begin to learn the ins and outs of bicycle touring. With Lake Champlain as our first goal, we’ll begin our northward ride through lush valleys, rolling hills, and picture-perfect villages, camping on the shores of serene Vermont State Park lakes along the way. 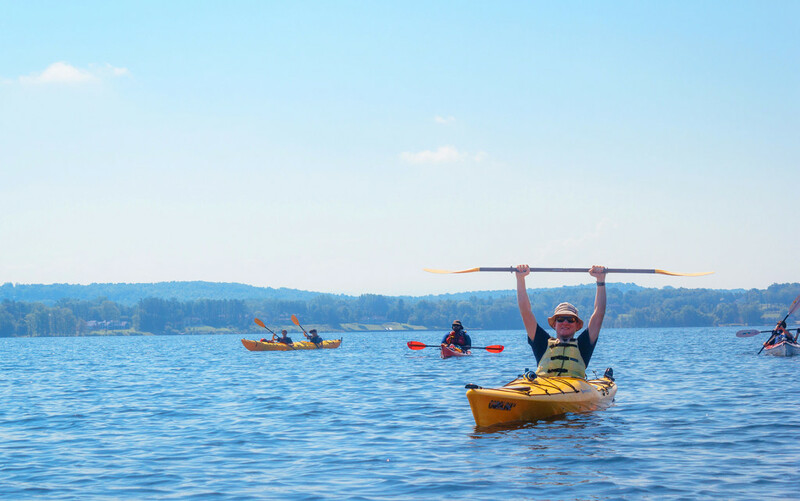 Reaching the shores of Lake Champlain, we’ll trade our bikes for sea kayaks and spend some time exploring Champlain’s gorgeous coves and bays with professional guides. Retrieving our bikes, we’ll follow the lake’s shore until we arrive in exciting Burlington, Vermont. We’ll kick-off our rest day by lending a helping hand cleaning and maintaining the Island Line Bike Trail or volunteering at a local community farm. Afterwards, we’ll walk Burlington’s streets and maybe even pay a visit to the flagship Ben & Jerry’s. Feeling well-rested, we’ll ride across Lake Champlain via the gorgeous causeway and bike ferry to continue our travels north. After making our way through Grand Isle State Park, we’ll reach our next big milestone as we pedal cross the Canadian border and into Canada’s fertile farmland. We’ll pick up the Route Verte (the “Green Road”) and travel this world-famous cycling path through the rural heartland, over the St. Lawrence River and into historic, French-speaking Montréal. Feeling fantastic about reaching our final goal, we’ll spend two nights and a full day exploring the sights of this dynamic city. A French feast and warm “adieus” will round out our time together in Montréal. How physically challenging is VM? Given a rating of Challenge Level 4 (out of a maximum of 10), we consider VM to be a beginner cycle-touring trip that any moderately fit, motivated student can successfully complete with some prior preparation. Compared to similar biking trips, we believe that VM is slightly more challenging than Cape Cod & the Islands (mostly due to extended mileage), but easier than Pacific Coast. Please note that all of Apogee’s Challenge Levels are not scientific and are subjectively calculated by the Apogee staff. Where will my child be sleeping on this trip? Our VM groups will be camping at established campgrounds for most nights on our trip, but we will spend the last two nights of our trip indoors in a Montreal hostel. 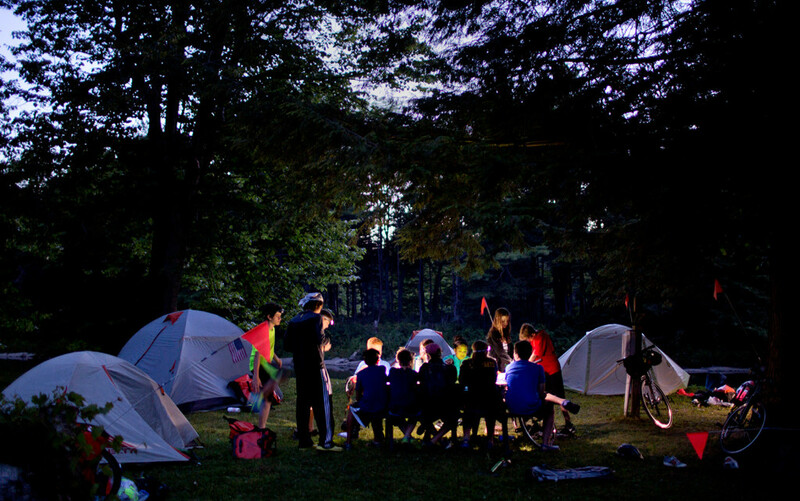 Leaders will separate students by gender into tent groups, and will rotate those groups several times over the course of our trip. Students will share a tent with one or two other students. My child is new to cycle touring and has never ridden with loaded panniers. Could my child participate without previous experience? Yes. Apogee’s trips are designed around the concept of “achievable challenge” – anyone who has a willingness to challenge themselves and possesses a basic to moderate level of physical fitness is already well-prepared. Upon your child’s enrollment, we will send you a suggested training schedule that we highly recommend your child completes prior to his/her trip. Training beforehand (especially with panniers and weight) will directly contribute to good risk management and your child’s physical comfort. No – we offer rental bikes (as well as panniers) for an additional fee. In 2019, the cost of a hybrid rental bicycle for the 12-day trip is $200. Waterproof rental panniers are available for $50. If your child already has a bike that is appropriate for this trip, they are welcome to bring it. Please call our office with any questions regarding the suitability of your child’s bike for this trip. The specifics of our community service projects and the number of hours we volunteer varies slightly from year-to-year. In the past, we have worked with Burlington Parks and Recreation on a variety of tasks including invasive species removal, bike trail maintenance, fence painting, etc. Students can expect 3-5 hours of community service work over the course of our trip, usually in a single day. You can expect to receive a phone call from your child twice during their trip, about once per week. Apogee’s tuition costs are meant to be all-inclusive and include all meal, accommodation, and activity fees. The most significant additional expenses on our Vermont to Montreal trip will include travel to and from Manchester, NH, a sleeping bag and sleeping pad, a bike helmet, and touring bike and panniers (rentals are available, see above).